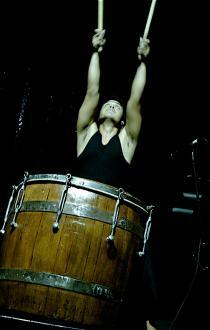 Inspired by Japanese Taiko and remote music from West Sumatra, Indonesia. The Rhythm Hunters fuse the thunder of taiko drumming with indigenous Islamic music from West Sumatra. Expect to see taiko, frame drums, kettle gongs, bamboo flutes, didgeridoo, log drums and West Sumatran folk songs woven into a dramatic visual spectacle. Escape to long echoes in hidden valleys of laughter, primal ceremony and the beat of a lone drum. Rendra Freestone is raising the profile of Sumatran music with this dramatic fusion. A physically choreographed style of drumming, very much a visual spectacle with a lot of physical action on stage including dancers, didgeridoo, harmonium, vocals and big spirit.